Since I began using interactive notebooks at the beginning of the school year, one thing that I have really enjoyed is seeing creativity shine in notebooks of my students. Several times I have created an activity to be used in a specific way in my mind, but, then, my students have managed to make it more interesting than I had anticipated. I love seeing this! 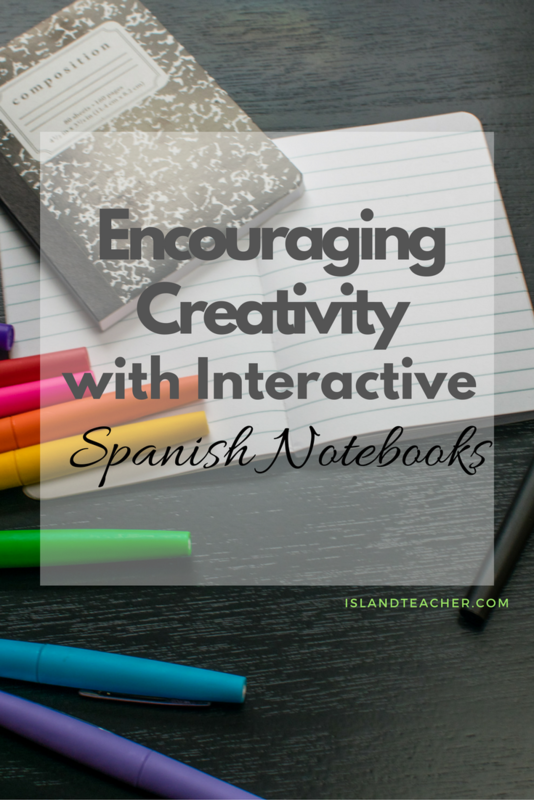 Not only are they learning Spanish in a different way, BUT they are really "owning" their learning experiences by making their notebooks unique. This past week we reviewed school supplies vocabulary. We viewed a PowerPoint with school supplies and students filled in a vocabulary list to add to one side of their notebooks. I had created an interactive notebook activity to go along with the topic. You can check that out in my store, HERE. My idea was for them to cut out and attach an entire pocket with a picture of a mochila to their notebooks and then add the school supplies. Here is what I came up with as an example before. I decided that I wanted students to draw the school supplies on blank templates and add their pictures, along with the Spanish term, to their mochila pockets. That way, students could review by matching the words with pictures or play a memory game with a partner. I passed out the materials and students got to work. As I circulated back around, I noticed that one student had cut out the picture of just the mochila instead of the pocket. Because I harp on the importance of READING the directions on the templates before beginning to cut, I began to remind the student of this. He had a different plan in mind though, and told me that it would be ok! The result? He cut a slit in the top of his backpack (instead of using the entire pocket), and showed me how he could add all of the school supply inserts and create a more "realistic" mochila for his notebook page. Hmmm...maybe I should just hire my students to make my activities? The point is that, even though this was a whole class activity, students were able to individualize their own notebook page however worked best for them. I LOVE it! I am inspired by and learn from them daily....for that I am thankful! Have your students taught you anything recently? Easy Meals for Busy Teachers! Ok, so I'm definitely not a chef, nor am I cut out to be a food blogger, but, besides scouring Pinterest and other blogs for teaching ideas, I'm always on the lookout for a meal idea. The easier, the better... especially when it comes to weeknight meals. Here's an idea that I got from a friend a long time ago. It is super easy AND fairly healthy, so that's a huge plus! I don't even know what it's called, so I'll call it Roasted Italian Sausage and Veggies. You can throw everything together in one pan. Here I used sausage, potatoes, sweet potatoes, red, green and orange peppers, mushrooms, onions, broccoli and cauliflower. To save time, we have an awesome salad bar in our supermarket that has pre-chopped veggies, so I'll just load up a container with these. Do you have a favorite easy meal to share? Snag the graphic at the top and link up with a blog post below! ¡Hola! Thanks for checking out Spanish Freebie Friday. I hope you'll stop by every Friday to check out a new FREE resource that you may find useful in your classroom. I hope to cover a wide range of resources as I embark on this project to post a new freebie each Friday this year. I love discovering new, helpful, fun resources and I'll be sharing them with you! Additionally, from time to time I'll offer a Friday FLASH Freebie where I'll list an item in my store for FREE for a very limited time. You'll want to follow me on Facebook to stay up to date on any FLASH Freebies! You can follow my blog via email (sign up on the side bar) OR Bloglovin to remember to check back on Fridays. This week's freebie comes from Spanish Plans. If you aren't familiar with his website, you can check that out HERE. His blog is a wealth of information. One of the things that I would like to do more often in class is incorporating Spanish pop songs. In this free resource, students complete a song cloze activity. 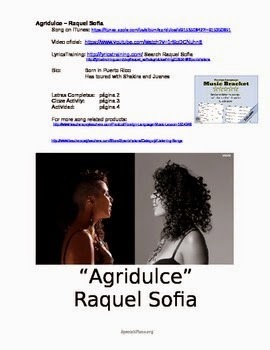 It also includes several other ideas for classroom use of the song, "Agridulce". You can download it on TpT HERE. 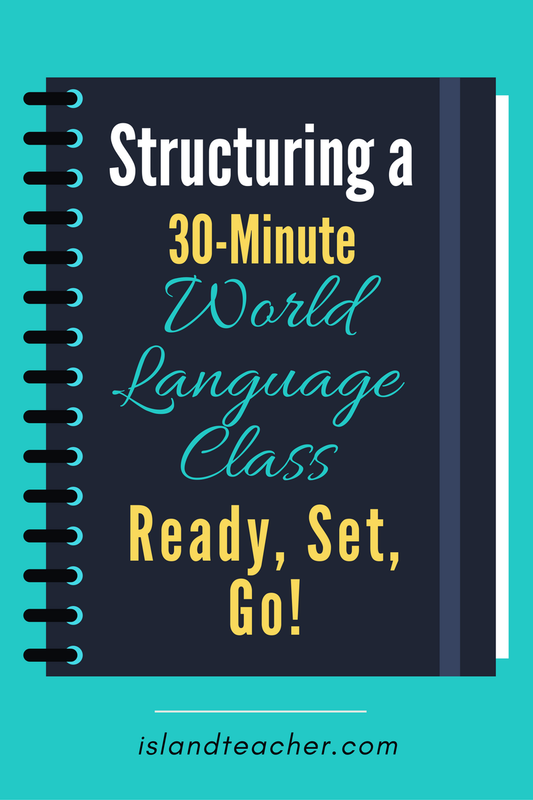 Structuring a 30 min World Language Class...ready, set, go! As THE Spanish teacher at a small, private school, I teach a wide age range. I'm currently teaching Spanish to grades 2-10. I see my elementary classes for 30 minutes, one day a week. I sometimes feel like I'm spinning my wheels because we spend a lot of time recapping previous material and it often seems that we move at a slow pace with new material. I thought I'd share an example play by play of 30 minutes in one of my elementary Spanish classes! Min 1-2 Students enter, greet me at the door (Hola, Buenos días, etc) as they pass by to their seats. I have my students keep folders which they leave in my room. I may hand these out now or wait until later in the lesson depending on what we're doing. Min 3-5 Oral Review Practice: This may be a Q&A ¿Cómo estás? ¿Cómo te llamas?, etc. We may do a few quick rounds of "I Spy": "Yo veo algo (insert color)" to review colors or we may count around the room. Min 6-9 Singing: Songs are a great way to teach and reinforce vocabulary. Calico Spanish Songs on YouTube are elementary geared and can be found in a variety of topics. I project these onto the SmartBoard and students sing along. I generally will choose a song or 2 over a topic we have covered or we may learn a new song to introduce a new topic. Min 10-15 Direct Instruction: This past week we began going over La Familia vocabulary. I showed a PowerPoint on basic family words with graphics. Student practiced pronouncing the words and filled in a vocabulary sheet as we went through the slides. This sheet gets added to their folders. Min 16-25 Activity/Game: This week, my lower elementary classes are making La Familia vocabulary books, so they began coloring their templates and adding the correct word to the pictures. 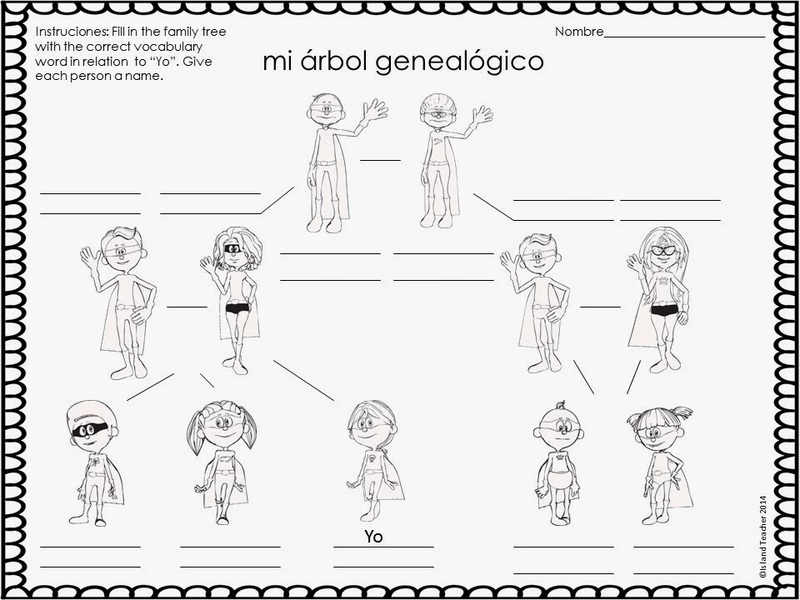 My upper elementary classes began a family tree diagram from my Mi Familia de Superhéroes set. While I created this packet for my secondary students, I've found that, with slight adapting, I can use it with my 4th graders on up. They write the appropriate label on each family member and assign a name to each character. Next class, we'll use the diagrams to do some basic oral practice. ¿Cómo se llama la madre? ¿Cómo se llama la hermana? etc. 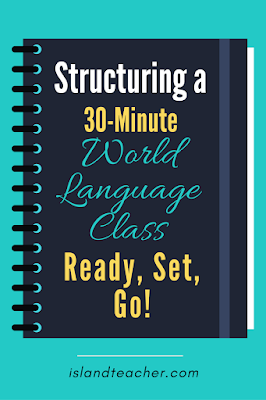 Do you have short language classes? I would love to hear how you structure these! 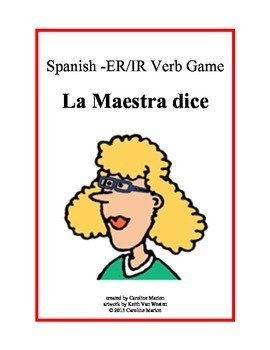 Spanish Freebie Friday: La Maestra Dice Game! This week's freebie comes from I Speak Your Language. It's a game to practice Spanish -ER and -IR verbs along with a conjugation worksheet. Students will practice filling in sentences, trying to make their sentence match with the sentence written by the teacher. Check it out HERE! ¡Hola! Thanks for stopping by the first edition of Spanish Freebie Friday. I hope you'll stop by every Friday to check out a new FREE resource that I like that you may find useful in your classroom. I hope to cover a wide range of resources as I embark on this project to post a new freebie each Friday this year. 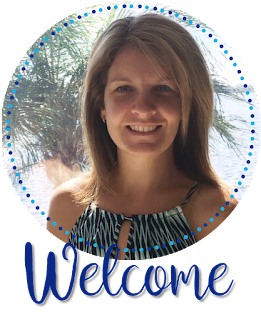 I love discovering new, helpful, fun resources and I'll be sharing them with you! Additionally, from time to time I'll offer a Friday FLASH Freebie where I'll list an item in my store for FREE for a very limited time. You'll want to follow me on Facebook to stay up to date on any FLASH Freebies! You can follow my blog via email (sign up on the side bar) OR Bloglovin to remember to check back on Fridays. This week I'm going to direct you back to an old post on using task cards in world language classes. If you haven't used task cards before, it should help to give you some ideas of how you may want to implement them in your classroom. My students really enjoy them and it's a nice change of pace. 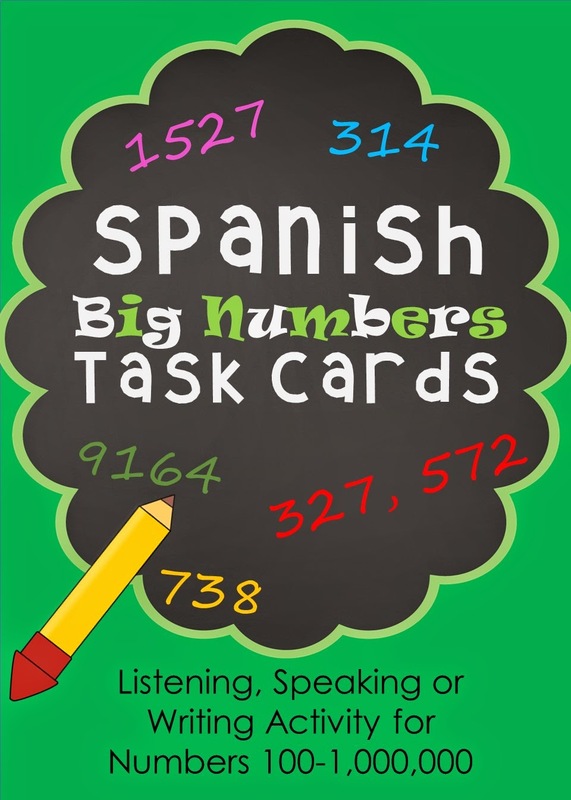 Here's a Task Card freebie to help students practice writing or speaking big numbers in Spanish! 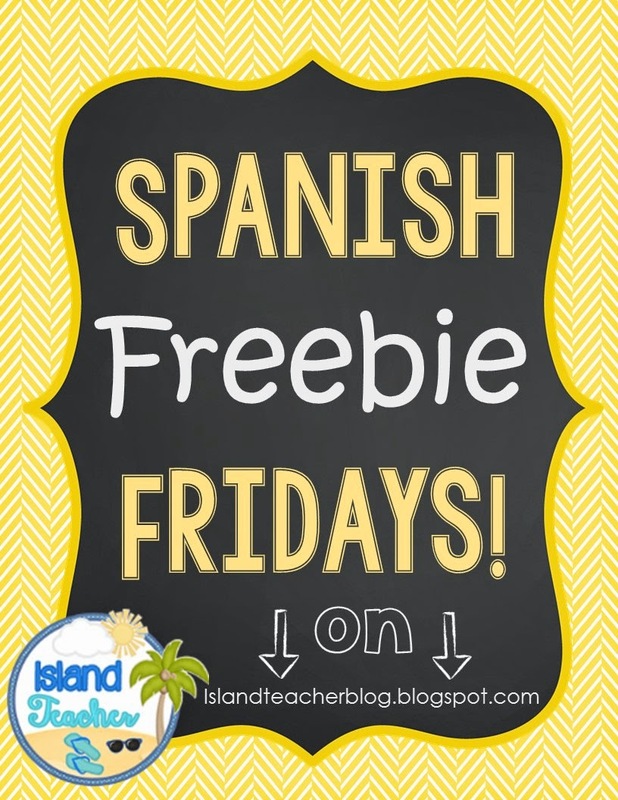 Do you have a freebie that you would like for me to consider sharing this year in Spanish Freebie Fridays? Feel free to send me a message! Have a fabulous weekend!